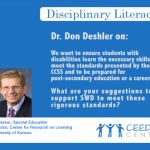 Dr. Don Deshler discusses how teachers can balance the need for foundational reading instruction with the need to teach content and disciplinary literacy strategies. 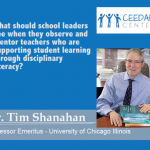 Dr. Don Deshler answers the following question in his exclusive interview with the CEEDAR Center. Click to download the slides from this webinar.